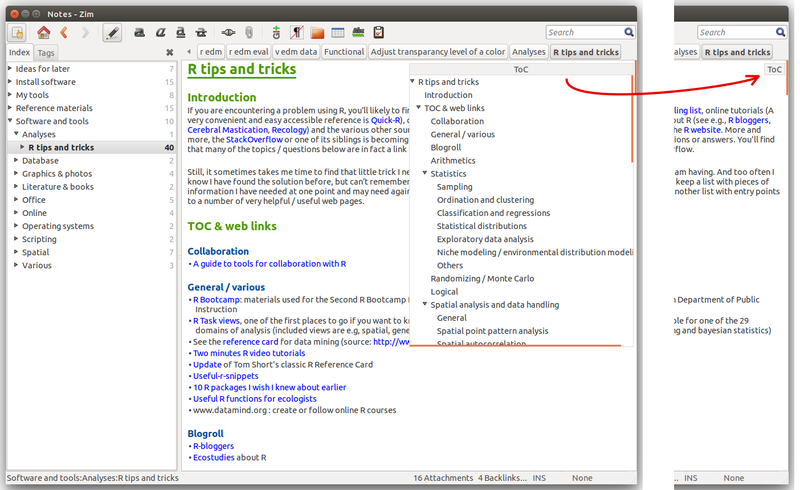 A new version (0.61) of the Zim desktop wiki, my favourite notebook / project organizer, was released today. Apart from a large number of under-the-hood improvements, it sports a number of very welcome new features. A more flexible export, allowing to export pages recursively. I.e., apart from the whole notebook or a single page, you can now also export sub-nodes. This was very high on my wish-list, great! And it is getting better with another point on my wish-list now implemented; the option to export multiple pages to a single output file. Export templates now support many more instructions and expressions. I had a quick look at the help file, and it looks like this has become a very powerful tool, albeit with a steep learning curve. Let’s see how this can help to further improve my current export template for a adaptive website. The “tags” plugin was changed to show full page paths in the per-tag view. Floating ToC, see screenshot below. Possibly my favourite new plugin, the Source view plugin, which allows inserting ‘code blocks’ in the page that will be shown as emdedded widgets with syntax highlighting, line numbers etc. You can download the new version from the Zim wiki website. I use ZIM desktop wiki to keep all kind of notes. Sometimes I want to share my notes. This is easy enough when I want to share the whole notebook. I simply send the whole folder containing the ZIM notebook (zipped or not) to my collaborator.